I wish you a happy Monday morning and a good start into this new week with Bryan Ferry and “Roxy Music”. 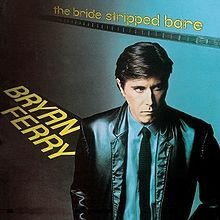 Bryan Ferry (born 26 September 1945) is an English singer and songwriter. His voice has been described as an “elegant, seductive croon”. He also established a distinctive image and sartorial style; according to The Independent, Ferry and his contemporary David Bowie influenced a generation with both their music and their appearances, with cultural critic Peter York commenting he “should hang in the Tate”. Described as ‘the most criminally overlooked designer in British fashion’, Antony Price put the ‘glam’ in Roxy Music’s ‘glam rock’. The designer’s fearless work with Roxy Music not only completely changed the image of rock into something altogether more, ahem, glam, but also paved the way for how fashion and music have become intrinsically linked. Had the era been slightly different, Price would no doubt have been inundated with offers at the time to back his eponymous occasion wear label – or handed the keys to a Paris couture house. Ferry came to prominence as the lead vocalist and principal songwriter with the glam art rock band Roxy Music, achieving three no. 1 albums and 10 singles which reached the top 10 in the UK between 1972 and 1982. Their singles included “Virginia Plain”, “Street Life”, “Love is the Drug”, “Dance Away”, “Angel Eyes”, “ver You”, “Oh Yeah”, “Jealous Guy”, “Avalon”, and “More Than This”. Ferry began his solo career in 1973, while still a member of Roxy Music. His early solo hits include “A Hard Rain’s a-Gonna Fall”, “Let’s Stick Together” and “This Is Tomorrow”. 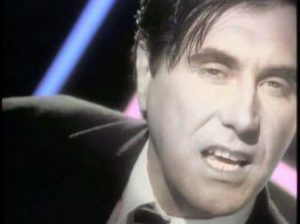 Ferry disbanded Roxy Music following the release of their best-selling album Avalon in 1982 to concentrate on his solo career, releasing further singles such as “Slave to Love” and “Don’t Stop the Dance” and the UK no. 1 album Boys and Girls in 1985. When his sales as a solo artist and as a member of Roxy Music are combined, Ferry has sold over 30 million albums worldwide. For the video “Angel Eyes” the “Roxy Music” fashion designer Antony Price developed something which became famous very much later as “Victoria’s Secret Angels”. As well as being a prolific songwriter himself, Ferry has recorded many cover versions of other artists’ songs, including standards from the Great American Songbook, in albums such as These Foolish Things (1973), Another Time, Another Place (1974) and As Time Goes By (1999), as well as Dylanesque (2007), an album of Bob Dylan covers. 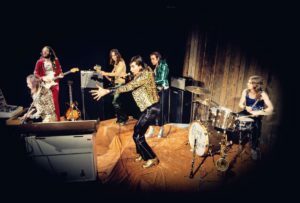 Ferry formed Roxy Music with a group of friends and acquaintances, beginning with Graham Simpson, in November 1970. 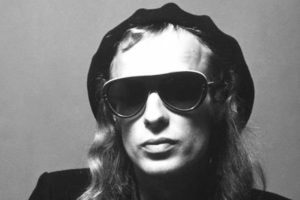 The line-up expanded to include saxophonist/oboist Andy Mackay and his acquaintance Brian Eno, who owned tape recorders and played Mackay’s synthesizer. Other early members included timpanist Dexter Lloyd and ex-Nice guitarist David O’List, who were replaced respectively by Paul Thompson and Phil Manzanera before the band recorded its first album (early Peel Sessions for the UK’s BBC Radio 1 feature O’List’s playing). 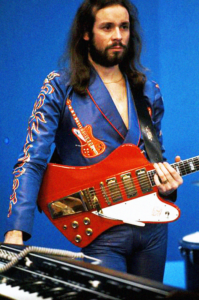 Roxy Music’s first hit “Virginia Plain” made the UK top 5 in 1972, and was followed up with several hit singles and albums, with Ferry as their lead vocalist and instrumentalist (he taught himself the piano in his mid-twenties) and Eno contributing synthesizers backing. After their second album, Brian Eno left Roxy Music, leaving Ferry its undisputed leader. Ferry started a parallel solo career in 1973, initially performing cover versions of old standards on albums such as These Foolish Things(1973) and Another Time, Another Place (1974), both of which reached the UK top 5. After the concert tour in support of their fifth studio album Siren, Roxy Music temporarily disbanded in 1976, though band members Paul Thompson, Phil Manzanera and Eddie Jobson took part in recording Ferry’s subsequent solo material. That year Ferry covered the Beatles’ “She’s Leaving Home” for the transitory musical documentary All This and World War II. He released three solo albums during this period, Let’s Stick Together (1976), In Your Mind (1977) and The Bride Stripped Bare (1978). All three albums reached the UK top 20. Roxy Music reformed at the end of 1978 to record tracks for their sixth studio album Manifesto, which was released in early 1979 and reached no. 7 in the UK album charts, with Ferry, Manzanera, Thompson and Mackay. The follow-up was 1980’s Flesh + Blood, which reached no. 1 in the UK album charts, two years before the group’s final studio release Avalon in 1982, which also reached no. 1 in the UK album charts. The band also achieved their first and only UK no. 1 single, “Jealous Guy”, released in 1981 as a posthumous tribute to its author John Lennon, who had been murdered two months earlier. It was the only one of their singles not to be written or co-written by Ferry. … Ferry decided to disband Roxy Music in 1983 and continue as a solo artist. The bonus track of today is Bryan Ferry’s song for the film “Legend” (1986) by Ridley Scott. David Gilmour (Pink Floyd) plays the lead guitar. The second bonus track of today ( because it’s the beginning of a new week ) is John Lennon’s original version of “Jealous Guy” performed with the “Plastic Ono Band”. I wish you a successful Monday and come back very soon with a new story about fashion & music.